Is wine a favorite component of your travel plans? Transporting glass bottles in your checked luggage can be risky, even if they are well-padded. No one wants red wine stains on their entire vacation wardrobe should the rough handling result in a broken bottle. 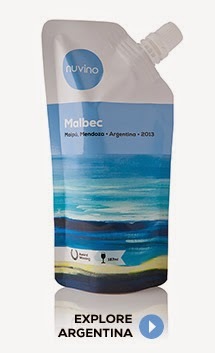 And boxed wine is…well, not very practical to travel with—and usually not very good. Now there’s a new option for wine-on-the-go. Nuvino is billed as wine without excess baggage. 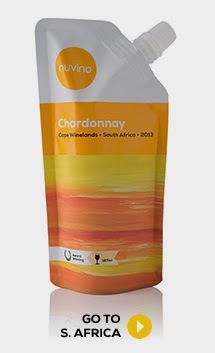 It’s individual servings of wine in a lightweight, unbreakable pouch. No corkscrew needed to open and no bulky glasses needed for serving. Nuvino is perfect for the beach or an outdoor concert, too. What about taste? Nuvino wines come from four internationally renowned wine regions. There’s a Sauvignon Blanc from the dry-farmed vineyards of Chile’s Maule Valley. Fresh aromas of white flowers, crisp citrus, green apples, and white peaches pair perfectly with salmon, salad, or lighter fare. The zesty un-oaked Chardonnay comes from two of South Africa’s wine regions and features a balance of vanilla, pineapple, and ripe peach flavors. The Red Blend hails from South Eastern Australia’s Swan Hill wine region. Smooth flavors of plums, mulberries, and oak flavor this soft, juicy wine. Produced in the eastern foothills of the majestic Andes mountains in the Mendoza’s Maipú wine region, the fruity Malbec is perfect with your favorite steak, barbecue ribs, or spicy-sweet dishes. Wow you learn something new every day. I had never heard about Nuvino before, and also love the name of the brand. Clever. Thanks for the post Beverley.